The Daily Essential. Light Texture. METEO LOGIC Moisturizing Fluid provides for all of the skin's daily needs: intense hydration, prevention of skin ageing and protection against the elements. Exclusive marine-origin active ingredients, including Alga-Gorria®, our patented extract with high antioxidant capacity, create a protective shield for skin cells. Moisturized, stregthened and protected, day after day the skin stays beautiful, feeling good. The Face Moisturizing Fluid has a matifying effect for a non-shiny, smooth finish. It goes best with the other skincare products in the METEO LOGIC® range. "Pleasant and effective! 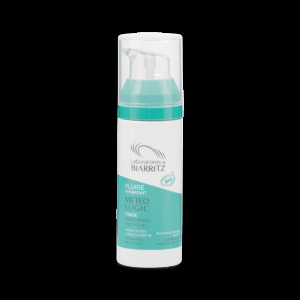 It is one of my favorite products"
The light and fine texture of METEO LOGIC® Moisturizing Fluid is ideal for normal to mixed skin types or in summer weather.